What's more American than bacon? Well, not a whole lot. But, when you add bacon to a few red, white & blue potatoes you have the makings of a potato salad perfect for celebrating America's birthday! I love potato salad, but I am extremely picky about it. I grew up on my Oma's German-style potato salad, which was simply dressed in a vinegar and oil combination (and not mayo). I have posted two previous renditions of that recipe here before (here with green beans and here with green beans and corn), but decided to take the recipe a few steps further this time: bumping up the flavor with a few add-ins and a new dressing and creating something that's perfectly patriotic and fitting for your Fourth of July picnic table by using red, white & blue fingerling potatoes! Cooled and boiled potatoes are combined with crisp red onion, fresh parsley, and salty crumbled bacon as the base of this potato salad. The dressing is a super flavorful honey Dijon vinaigrette. 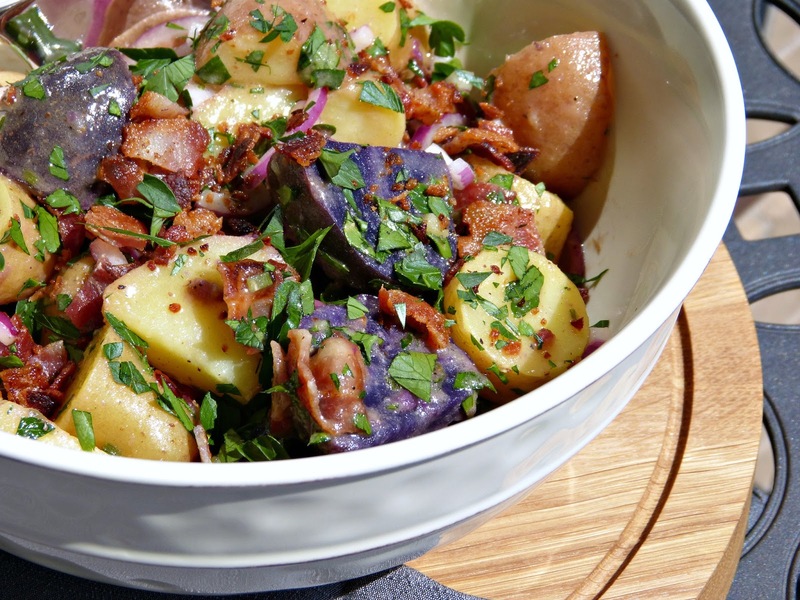 It may not be your traditional potato salad dressing, but the flavor is wonderful-- especially with the bacon. It's a sweet and tangy and it's dairy and mayonnaise-free so it's a great dish to serve outdoors at a Fourth of July picnic or barbecue. I'm signing off and heading north to Michigan for the holiday weekend... back next week with more fun foodie content on the blog! Have a safe and happy Fourth of July! Bring a large pot of water to boil. Add potatoes and cook until fork tender, about 15 minutes (give or take up to 5 minutes depending on the size of the potatoes). Drain the potatoes and cool completely. Cut the potatoes into 1-inch chunks and set aside. Tip: The cooler the potatoes, the easier to slice so sometimes I like to boil the potatoes the day before or earlier in the day and refrigerate them before dicing. In a large bowl, whisk mustard, honey, oil, chives, pepper, and salt until fully combined. 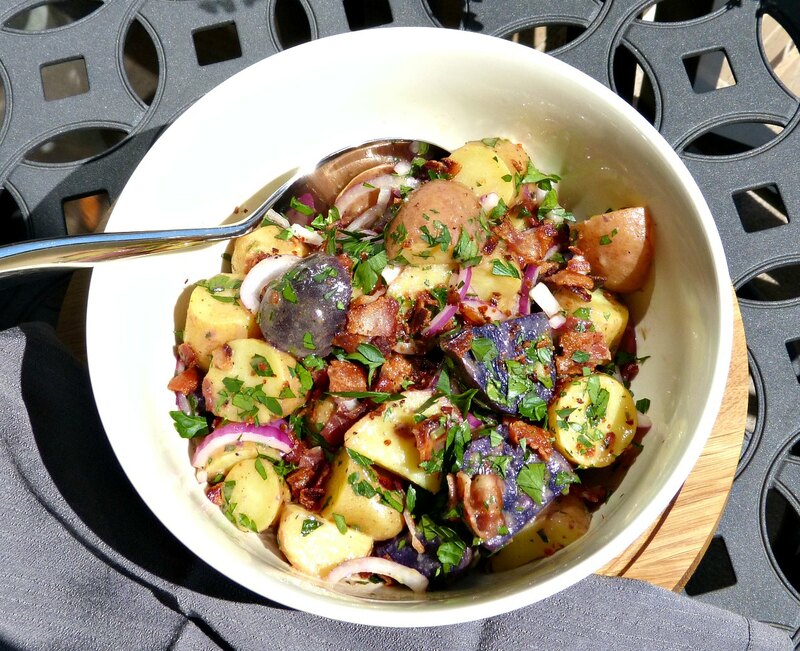 Add diced potatoes, onion slices, crumbled bacon and parsley to the dressing. Toss well to coat completely. Fourth of July weekend is upon us and with the holiday falling on a Monday, I'm predicting an extra long weekend of cookouts and parties is headed our way. I, for one, can't wait to head up to northern Michigan for a few days with the family! It's been a long time since I've celebrated this holiday with family as normally we're here in the city watching fireworks over Lake Michigan. This year, though, I'm looking forward to bonfires, lakeside lounging, and a few big family-style barbecues! 1. 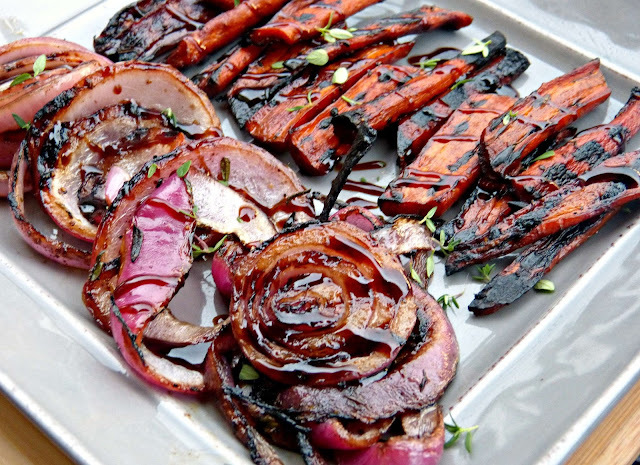 Honey Balsamic Grilled Carrots & Onions - Talk about a show stopper! Those gorgeous grilled veggies pack tons of flavor and can be prepped a day ahead of time, so all you have to do is throw them on the grill a few minutes before it's time to eat. 2. 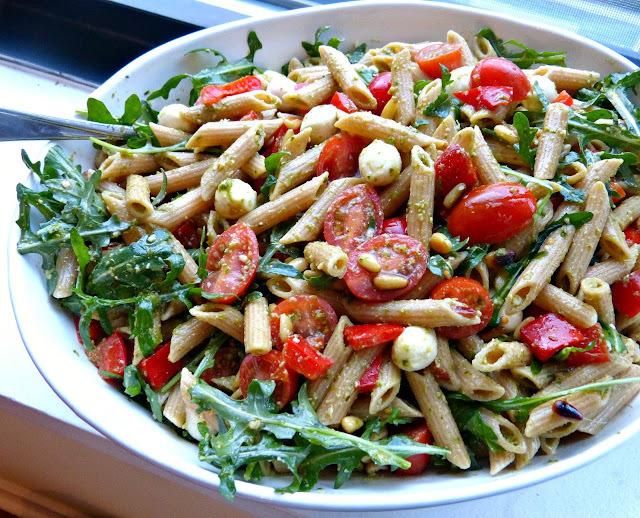 Pesto Pasta Salad - This super easy pasta salad comes together quickly and can easily feed a crowd. And the flavors of bright pesto, fresh veggies, and creamy mozzarella are total crowd pleasers too. 3. Tangy Apple Red Cabbage Slaw - This sweet and tangy spin on coleslaw is a great alternative to the traditional recipe. And it's a perfect compliment to barbecued pork, ribs, or sausage! 4. 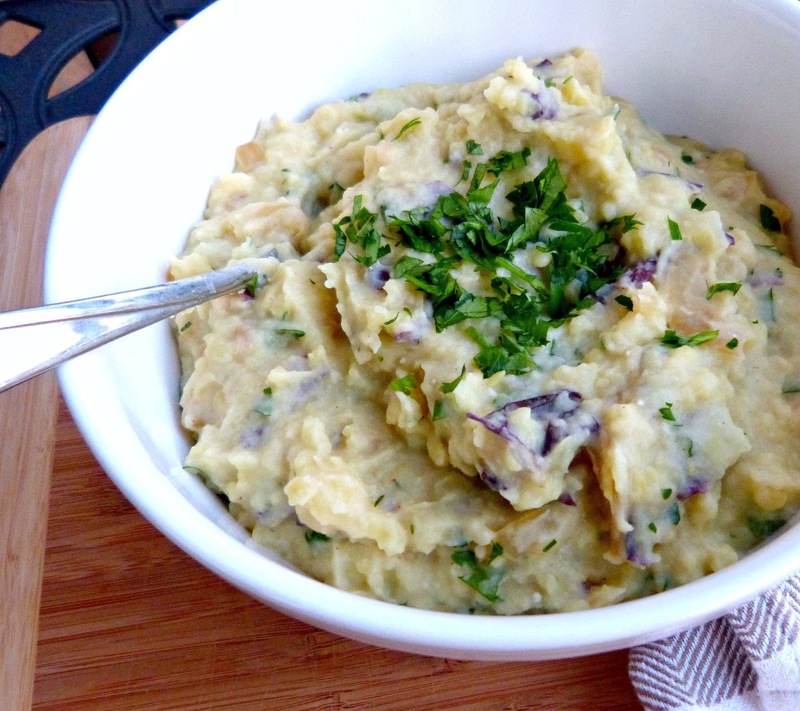 Caramelized Onion Smashed Potatoes - These rustic smashed potatoes get a boost of flavor from fresh herbs and sweet caramelized onions. They're delicious served alongside any grilled protein. 5. 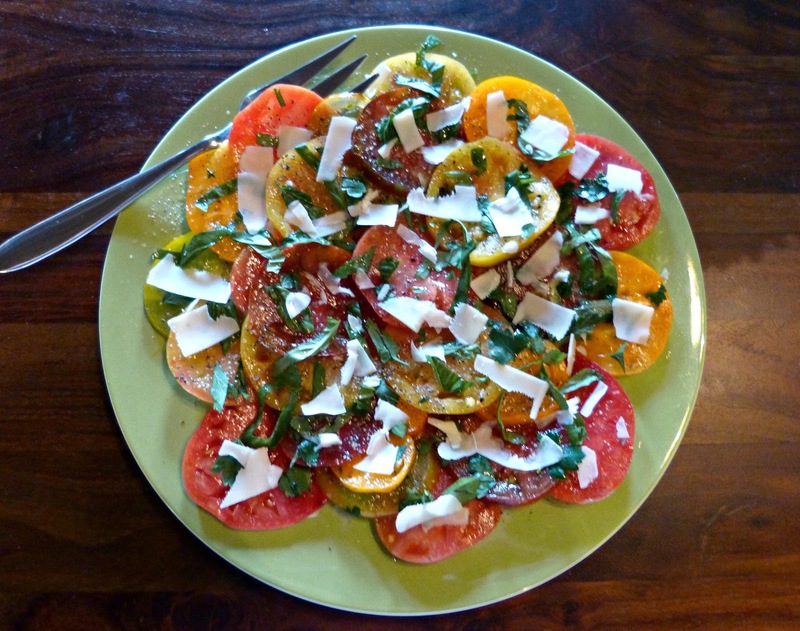 Heirloom Tomato Salad - This simple salad is a colorful addition to any table thanks to an assortment of fresh heirloom tomatoes from the farmer's market. It only requires a few standard ingredients beyond the tomatoes and fresh herbs, but the amazing flavor just screams "summer!" 6. 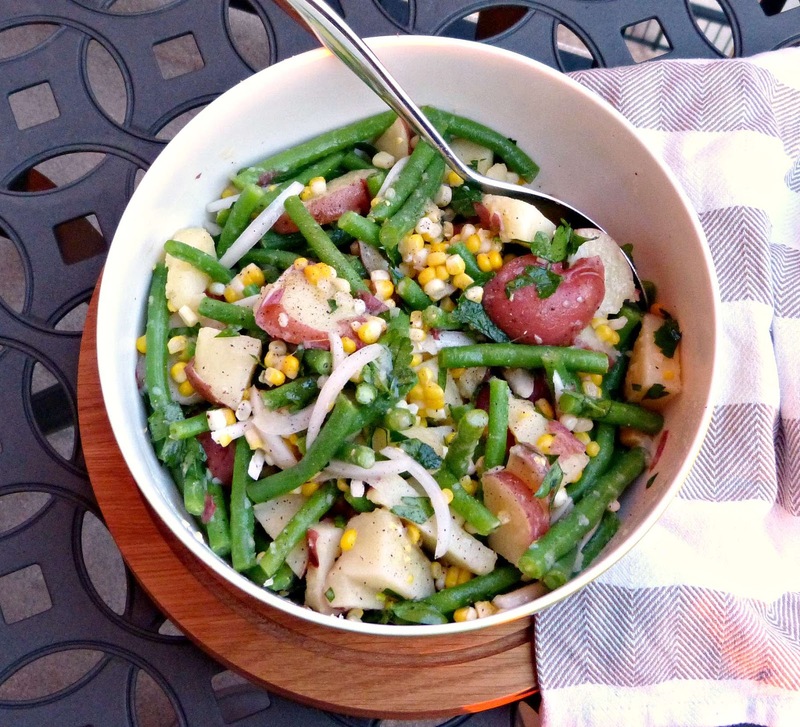 Potato, Corn & Green Bean Salad - This recipe is a summery variation of my Oma's traditional German potato salad. Potatoes and onions in a light vinaigrette are complimented by green beans and corn-- two of summer's best veggies! 7. 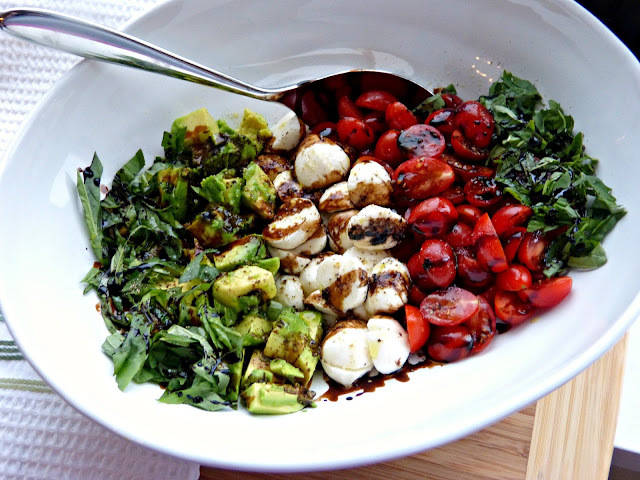 Tricolor Caprese Salad - Avocado is a delicious addition to this traditional caprese salad. It's a tasty side dish, but hearty enough to serve as a main course for any of your vegetarian guests too. 8. 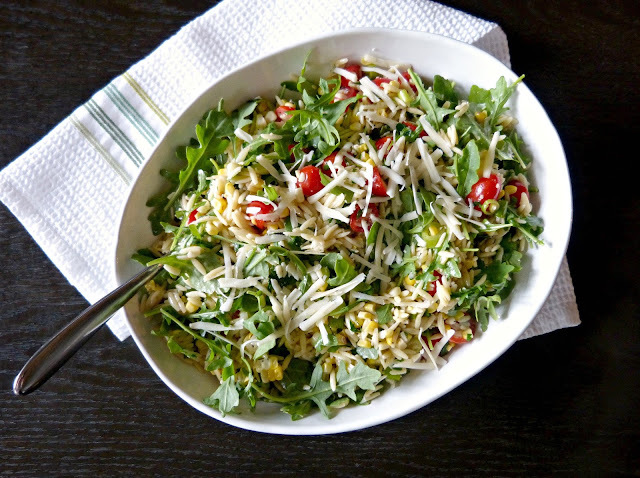 Orzo Salad with Corn, Arugula & Tomatoes - This simple orzo salad tastes like summer: sweet corn, fresh tomatoes, peppery arugula, and salty Parmesan all tossed in a tangy lemon vinaigrette. It's the perfect balance of flavors. 9. Baked Chinese Five Spice Fries with Sriracha Ketchup - These fries get their color from the beautiful purple-red potatoes that I picked up at the farmer's market. 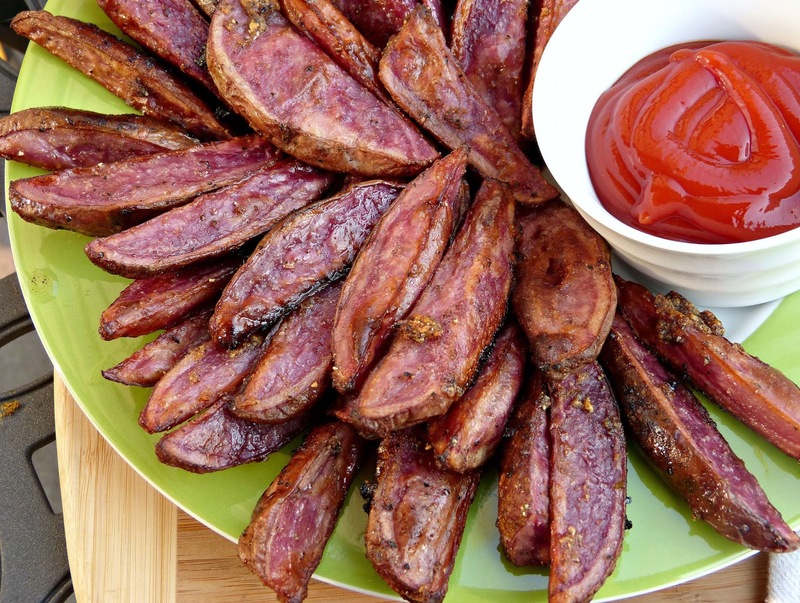 You can use any kind you'd like though because the real stars of this recipe are the vibrant Five Spice seasoning and the sriracha ketchup for dipping. 10. 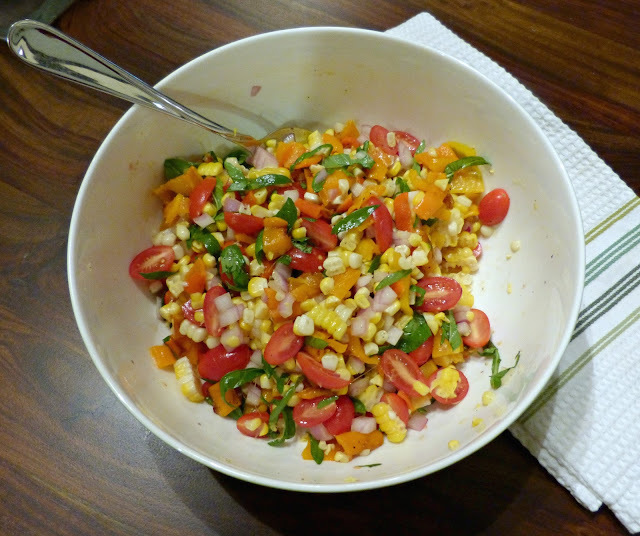 Sweet Corn, Tomato & Roasted Pepper Salad - This simple salad is a perfect complement to any grilled meal. It's fresh and light and full of summer flavor. Food bloggers must have a lot of overripe bananas in their kitchens these days. 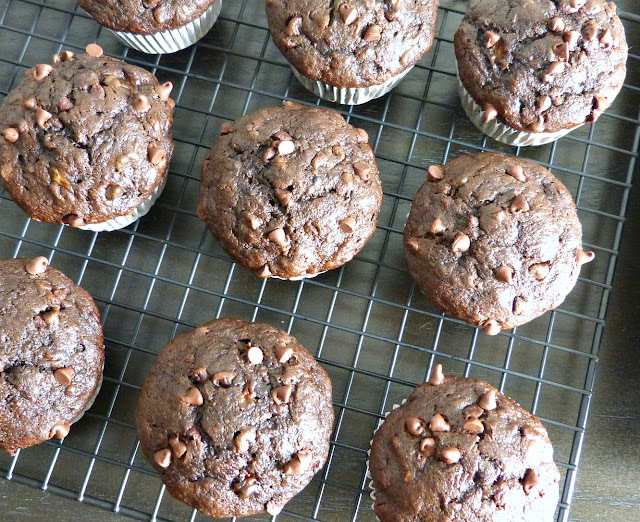 Right around the time that I made these muffins, 2 or 3 of the food bloggers that I follow were posting their own versions of a chocolate banana muffin recipe. Hope you haven't seen enough of them yet because these deep dark chocolatey version is the perfect was to use up that pile of bananas that are currently browning on your kitchen counter. 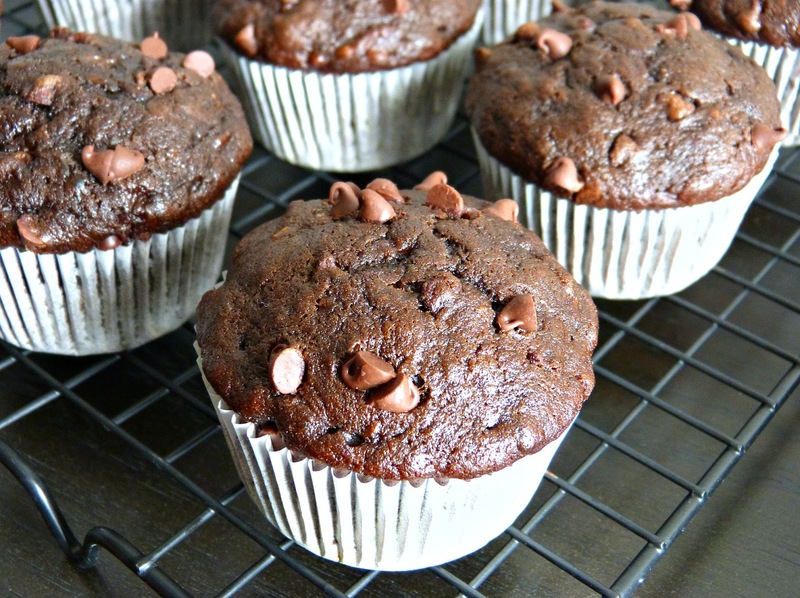 One of the best things about this recipe-- besides the fact that these muffins are moist and full of chocolate flavor-- is that it utilizes mostly pantry staple ingredients. So as long as you overestimated how many bananas you needed at the store last weekend, you likely already have everything you need for these muffins in your kitchen. The real secret ingredients here are the Special Dark Cocoa Powder and the instant espresso powder. The cocoa powder has a deeper richer flavor than traditional cocoa powder. And the espresso doesn't make the muffins taste like coffee, but just enhances the chocolate flavor. It's a great secret ingredient for any brownie or chocolate cake recipe! The bananas add much needed moisture and also a hint of banana flavor to these muffins, so you really do need to appreciate that chocolate banana flavor combination to like them. Not a fan? Try this Mocha Zucchini Cake-- it's a lightened up chocolate cake recipe using zucchini, which has no effect on the flavor, but keeps the cake super soft and moist. Or are you more of a banana muffin purist? This is my favorite banana bread recipe (c/o Flour Bakery in Boston). Preheat oven to 350 degrees. Lightly grease a muffin tin or line with cupcake liners. In a large bowl, mash bananas until smooth with only a few small chunks. Stir in oil, eggs, sugar, and vanilla until fully combined. In a separate medium mixing bowl, sift together flour, cocoa, espresso powder, baking soda, salt, and baking powder. Add to banana mixture and stir to combine. Fold in the chocolate chips (and optional walnuts). Spoon the batter into the prepared muffin pan-- about 1/4 cup of batter per muffin. Bake for 25 to 30 minutes, until a toothpick inserted in the center comes out clean. Old Navy Maternity Lounge Pants - I bought a pair of these pants in my third trimester and wore them every weekend through Hannah's birth. I bought a second pair and basically lived in them for the first month after she was born. They are so comfy and were the only pair of pants (maternity or otherwise) that I could wear for some time that didn't hurt my post-C section abdomen. Coconut Oil - Everyone already knows that coconut oil is magical, but I've found a ton of new uses for it postpartum too. Since it's all natural and not harmful to baby, I use it as a nursing moisturizer instead of traditional lanolin. And after my C-section I had bandages and sensors that were removed from my body that left heavy duty adhesive residue behind. It was almost impossible to remove, no matter how hard I scrubbed. I used coconut oil and it came right off! 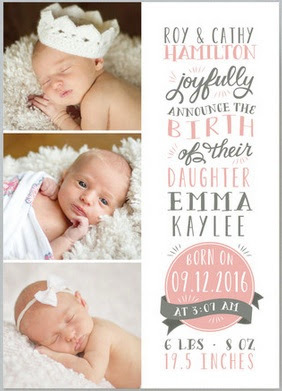 It's also a great way to incorporate healthy fat into your diet, which is especially important for nursing moms. I use it in my lactation cookies recipe. Slipper Socks - Make sure you have at least one pair of these in your hospital bag! 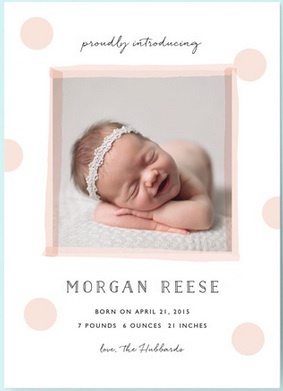 They'll likely give you a pair at the hospital, but it's nice to have your own-- the cozier, the better. They're comfortable enough to sleep in and wear all day, but having the grips on the bottom means you won't skid on the slippery hospital room floors. We have hardwood floors at home, so I like to wear them around the house too while I'm carting Hannah around with me. Mustela Belly & Bust Pregnancy Skincare Set - I started using these products when I woke up in the middle of my third trimester and tons of stretchmarks had suddenly appeared on my belly. Mustela is not inexpensive, but so far theis been more effective than I imagined a topical lotion could ever be. 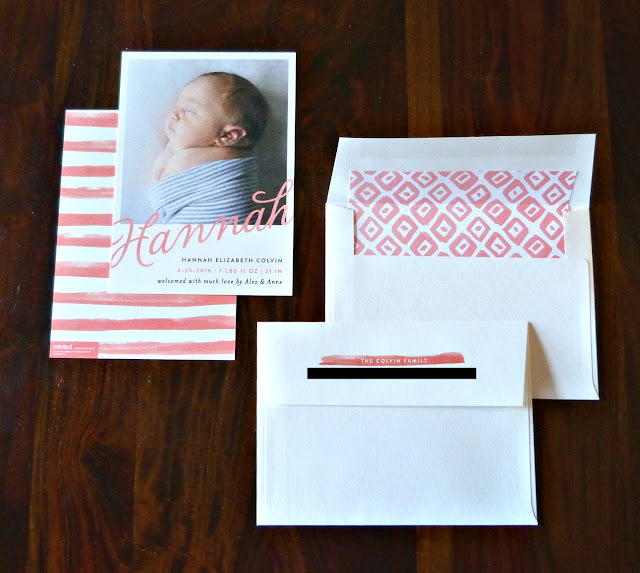 You can use them during pregnancy, afterward, and they're safe for nursing moms too. Dry Shampoo - Because there are a lot of days when you don't have the energy, time or desire to wash your hair, dry shampoo is the best quick fix. It will buy you a day (or two) without washing so that you can concentrate on other important things like sleeping, drinking coffee and carrying your little baby around. Dove is my go to brand for a dry shampoo that's light, not stiff, and blends well. Bump in the Night Nursing Nightgown & Robe - I originally purchased this set so that I could have a thin and comfortable robe to wear at the hospital. 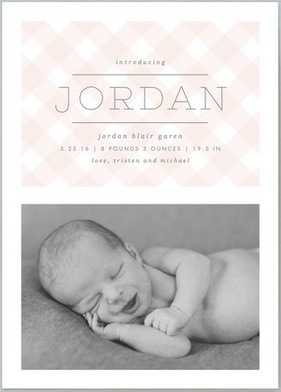 This ended up being one of the best purchases I made for my postpartum self. I was in the hospital for several days so it was really nice to have a comfy nursing-ready nightgown as an alternative to my hospital gown and the robe was great for when visitors came by-- as well as for walks around the floor. Since we've been home, it's received just as much wear since it's so lightweight, loose around my abdominal area (which was sore for a few weeks), and it makes late night nursing sessions easy. Plus, it's cute and not frumpy, which cannot be said for most of what you're wearing at the hospital and in the following weeks! Itzy Ritzy Nursing Happens Infinity Scarf - When it comes to taking Hannah out and about as a brand new mom, one of the biggest sources of anxiety for me (beyond her having an uncontrollable meltdown) is the idea of having to nurse her in public. If I don't have a bottle ready on hand, this nursing scarf is a godsend-- it opens up big to provide tons of coverage on my front and back sides and provides nice support for baby too. 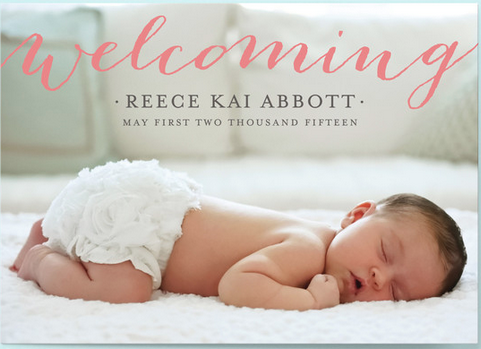 Baby 411 - I know pretty much nothing about being a mom to a newborn. That coupled with the fact that I worry too much about just about everything is a recipe for disaster. This book has helped to keep me a little more sane during these first several weeks. 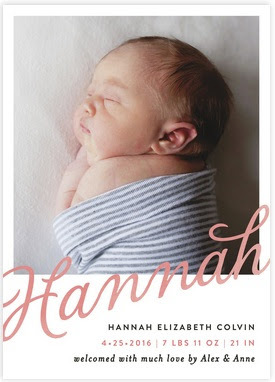 Like when Hannah has several bouts of body-shaking hiccups in one day and I start to panic, this book (which is also recommended by most pediatricians as the 'go to' baby parenting book) lets me know that it's normal and that I can calm down. Old Navy Sleeveless Split-Back Tank - This isn't a nursing or maternity tank, but it has been my #1 favorite postpartum top. It's loose fitting and flattering around my midsection and is perfect for wearing over a nursing cami. Within a few weeks of our return from the hospital summer had arrived, so this has been a perfect top for wearing around the house and out and about because it's sleeveless, cute, and functional. It's also an amazing price so I own it in 3 colors now! Heating Pad - You'll never need a good heating pad more than you will as a mom to a newborn. Mine has never seen more use than it has recently. From post-C section abdominal pain to clogged ducts (a painful reality of new motherhood) to the neck and shoulder cramps you never knew you could experience from carrying around an 8-lb. baby, the pain is real. And a heating pad is a super helpful item to have in your recovery arsenal. 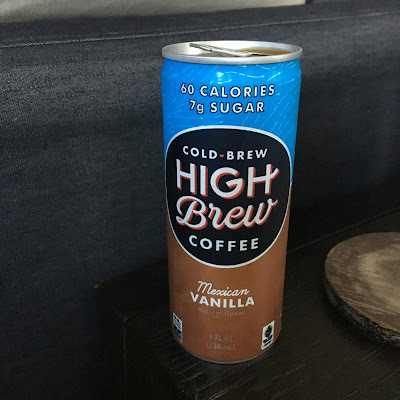 High Brew Coffee - High quality cold brewed ice coffee in a can is the easiest way to get your caffeine fix on mornings where baby just wants to be held or you're too darn tired to brew your own coffee! Glow Baby App - I started using the Glow family of apps when we decided to try for a baby. The Glow app is a great fertility tracker which prompts you to download Glow Nurture, their pregnancy tracker app. Once baby arrives, they offer Glow Baby which I am currently using. 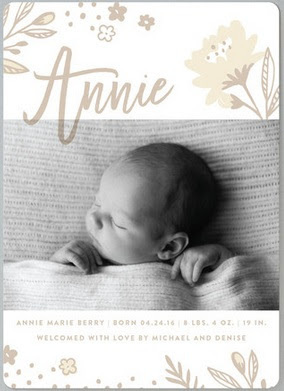 It allows you to track the times and details of each feeding, diaper change, and sleep cycle, which is immensely helpful as the more tired you are, the more difficult it becomes to remember when those things last occurred. 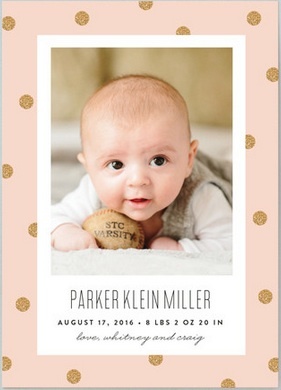 The app also features helpful FAQs for new moms and developmental milestone tracking too. Instacart - Especially in those first few weeks, just the idea of going to the grocery store felt overwhelming... forget actually going. But just because I didn't feel up to going didn't mean that milk, cereal, and bananas would magically appear in my kitchen. Thankfully, Instacart is available and I could have these items (and pretty much anything else from my local grocery store or pharmacy) delivered to my door within hours of ordering them. Try Instacart today and use code ACOLVIN71 to get $10 off your first order! Summer is finally here and in Chicago, we do our best to make the most of this season. And that means doing almost anything and everything outdoors-- including drinking! It's been a while since I've been able to partake in a glass of wine, so it's fun to finally be able to do so again right when the weather gets nice and the weekends get lazy. Now that I can enjoy a cocktail again, it's been great to discover some new or new-to-me beverages and I wanted to share them with you today. Here are a few of my new favorite summer-ready drinks. Cheers! 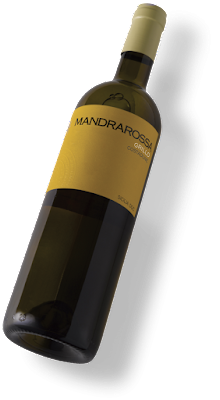 Mandrarossa Grillo Costadune - There's nothing better than a crisp glass of white wine on a hot summer night! I have recently discovered Grillo, which is a white grape native to Sicily. Grillo has wonderful balance of bright fruit and herbal flavors and a little acidity. If you love Pinot Grigio or Sauvignon Blanc like I do, this is the perfect wine to try if you're looking for something new. It pairs perfectly with grilled veggies or light proteins like chicken and pork, so bring a bottle to your next cookout! Truly Spiked & Sparkling - If you're looking for a summer beverage that is super light, really refreshing, low calorie (!!) and still falls into the 'cocktail' category, Truly Spiked & Sparkling is it. When my mom was here visiting we spotted these at my local grocery store and picked them up on a whim. These taste like flavored sparkling water with a hit of alcohol. Unlike other bottled alcoholic beverages, these are not super sweet-- we tried the Grapefruit & Pomelo variety and loved the tart and not sugary flavor. Bantam Rojo Cider - Weeks before I had my baby, the universe gave us a brand new craft beer store just a few blocks away from home. Don't you love when that happens? Alex and I stopped in one night to stock the fridge and I went straight to the hard cider section. 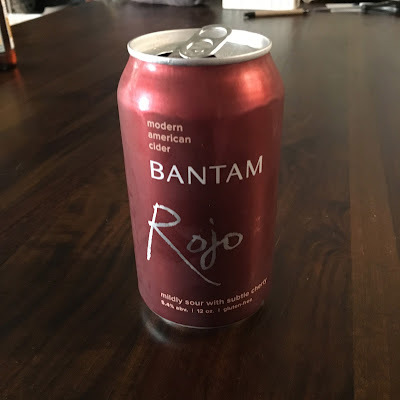 I've never seen Bantam Rojo before and intrigued, I picked up a pack. It's a really crisp cider that's slightly sour and it gets it Rojo (red) name from the addition of sour cherry, which is so delicious and tastes like summer! Also, this cider is brewed in Somerville, Massachusetts, the location of my first job out of college... Bantam and I are MTB and I'll be trying the Wunderkind variety on my next trip to Bitter Hops. Caves D'Esclans Whispering Angel Cotes de Provence Rose - I've become a huge fan of rose-- especially in the summertime. And Whispering Angel-- despite the goofy name-- is one of the best. It is fresh, fruity, dry, and everything I want from a rose. High Brew Coffee - Okay, so it's not alcoholic but as a sleep deprived new mom coffee trumps pretty much all other beverages. 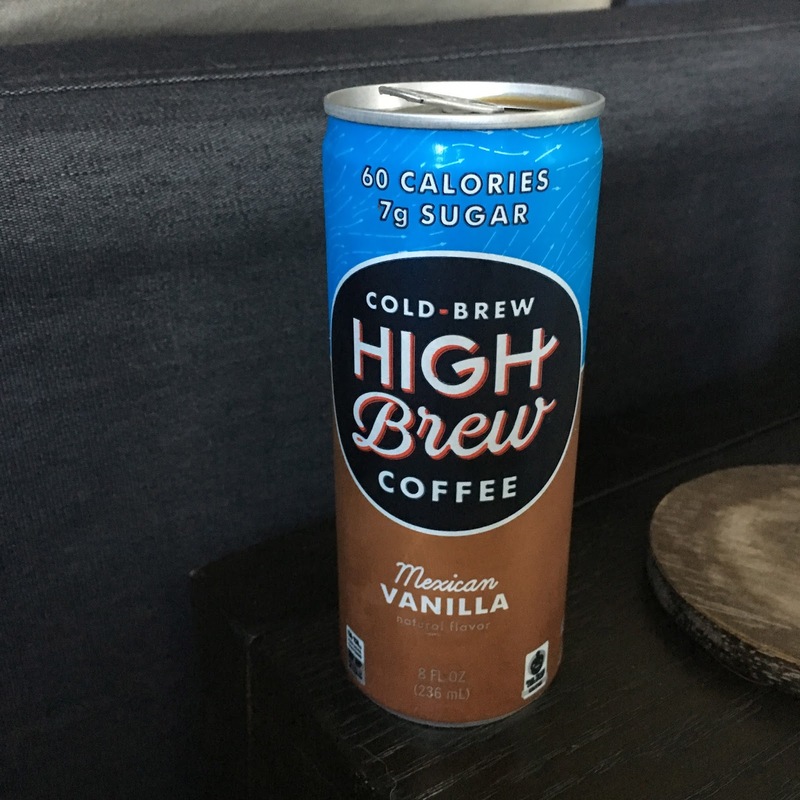 High Brew is cold brewed iced coffee in a can-- and it is surprisingly delicious! I'm obsessed with the Mexican Vanilla flavor which has only 60 calories. It's the perfect coffee to grab on the go-- or to open up when you can't put your baby down to brew a fresh pot! Editor's Note: Samples of Mandrarossa Grillo Costadune were provided to me in order to facilitate this post. The opinions expressed herein, as always, are my own. Making lunch these days sometimes resembles an episode of Chopped. I've told you before how much I hate packing a lunch for work and that I'm terrible about planning ahead for that when we're grocery shopping. Well, I hate to admit that even being home on maternity leave with my whole kitchen at my disposal I am still just as inept and unprepared... so lunch usually ends up being leftovers (if I'm lucky) or some combination of whatever is in my fridge: a little broccoli, strawberry jam, hummus, and a hamburger bun... Go! Thankfully, the components of last week's fridge were much more conducive to creating a good meal. In fact, I came up with something so easy and tasty that I wanted to share it with you today! It may be "What's for Dinner Wednesday"-- and this makes a great dinner with a little side salad-- but these quesadillas are a filling and delicious meatless lunch too! I always forget how much I like smoked gouda until I have it again. And there was a block of it leftover in my fridge after my parents visited and made us a huge pan of mac and cheese. 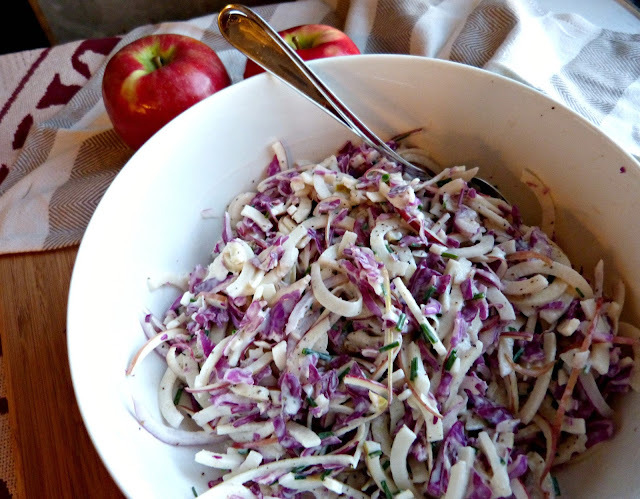 So, I decided to put it to use and paired it with sweet apples and a tangy mustard. 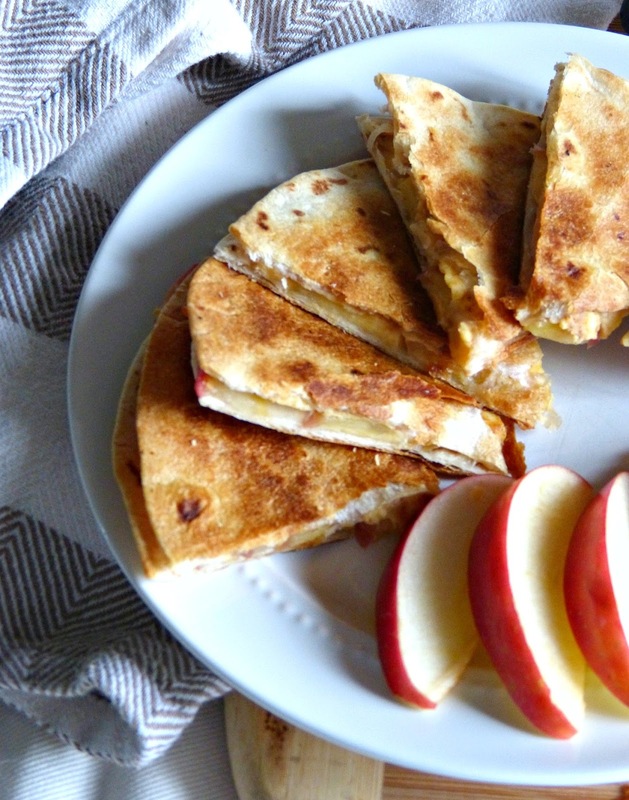 That combination of smoky, sweet, and sour is so perfect-- especially when it is all wrapped up in a toasty tortilla and the cheese is all melty. I also made extras and simply wrapped them in foil and reheated (in the foil) in the oven the next day for another delicious easy lunch! Lightly grease a baking sheet with olive oil and evenly arrange 2 tortillas on top. Spread 1 Tbs. mustard evenly over the top of each tortilla. 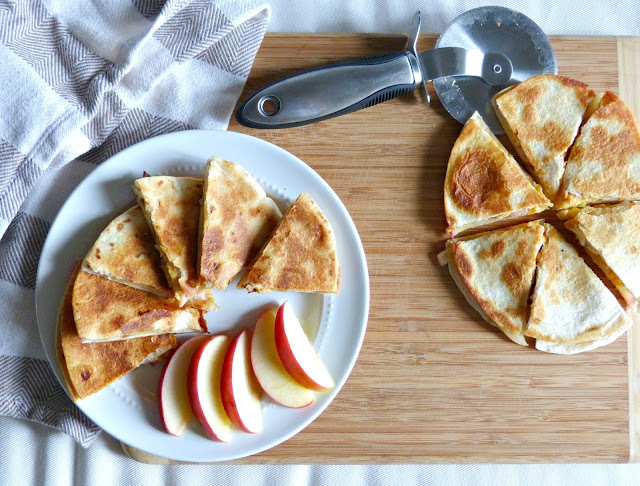 Sprinkle half the cheese evenly on top of each tortilla and layer evenly with apple slices. Top with remaining cheese and place a second tortilla on top of each one. Drizzle lightly with olive oil and bake for 12 minutes. Gently flip each quesadilla and bake for an additional 5 minutes. Celebrate National Egg Day with Nellie's Certified Humane Free Range Eggs! As a mom to a newborn, I must admit that all you veteran moms are right: this maternity leave stuff is no joke! 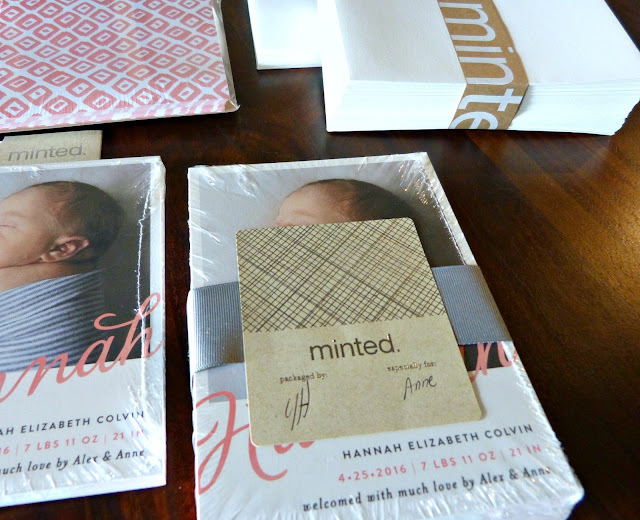 Even though Hannah sleeps for more than 3/4 of the day, I'm still not sure where the rest of my free time goes. And I'm not talking about free time for pedicures and naps, but free time for things like laundry, showers, and eating... You know, important things. Eating well is really important to me-- and even more so now that I'm a mom, but finding time to make something healthy while I'm home by myself is a challenge. Quick and easy recipes are key and eggs are one of my go to ingredients for fast healthy lunches these days and this salad has been in heavy rotation lately. Peppery arugula and sweet tomatoes are simply dressed in olive oil and fresh lemon juice. It's finished off with a little nutty Parmesan and the star of the show: a hot freshly fried egg. It's fresh, full of flavor, is packed with nutrients, and it comes together in less than 10 minutes! 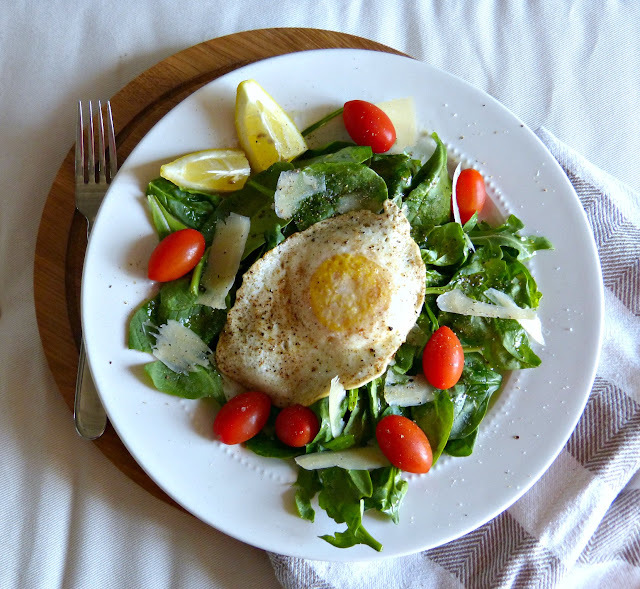 Eggs are an excellent source of protein for new moms (and everyone else too), but I felt even better about eating this salad because it is made with Nellie's Certified Humane Free Range Eggs. Nellie's is the first Certified Humane(R) farm in the United States, meaning that they ensure their hens are never caged and have access to the outdoors. Nellie's is also a big supporter of small local and family farms, unlike most large scale factory-farmed eggs. I'm so pleased to be partnering with them today to bring you this easy and delicious recipe in honor of National Egg Day! Nellie's Certified Humane Free Range Eggs are available at most major grocery stores (I buy them at my local Jewel-Osco!) and you can find a full list of where they're available near you right here. Juice of 1/4-1/2 lemon *This just depends on how juicy the lemon is and how tart you'd like your salad to taste! This recipe makes one entree salad. Arrange the greens and tomatoes on a plate. Drizzle evenly with olive oil and lemon juice. Use a vegetable peeler or grater to shave the Parmesan over the top. Heat butter in a small nonstick pan over medium heat. Crack the egg directly into the pan and cook until the egg whites are set, 2-3 minutes. Carefully flip the egg with a spatula and cook for another 1-2 minutes. 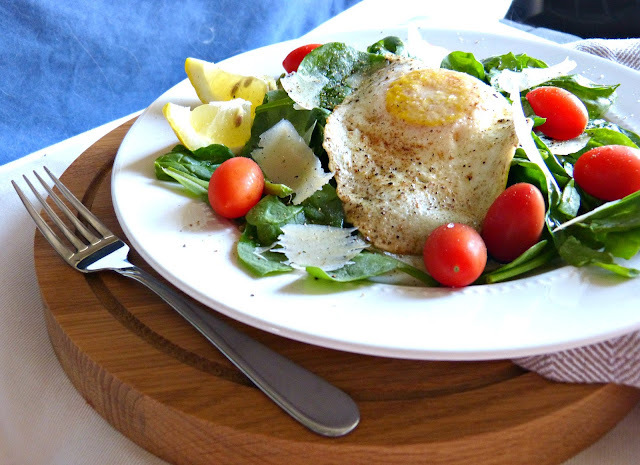 Transfer the fried egg to the top of the salad, season with salt and pepper, and serve immediately. Editor's Note: This post was sponsored by Nellie's Certified Humane Free Range Eggs, but the opinions expressed herein are my own.